Hermano Eric Contreras Named Principal of Stuyvesant HS | La Unidad Latina, Lambda Upsilon Lambda Fraternity, Inc. 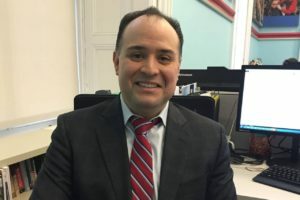 The new principal of the elite Stuyvesant High School will be Eric Contreras, a former teacher and head of the city Department of Education’s effort to revise its social studies curriculum. Department officials plan to announce Monday that he will lead one of the city’s most competitive schools, which admits students based on a single exam score. Mr. Contreras, 43 years old, can approach the job with a parent’s perspective; his daughter graduated from Stuyvesant last month. Raised by an immigrant single mother who worked as a housekeeper, Mr. Contreras spent his early years in Guatemala and started first grade in a Queens public school speaking little English. He said his mother took him to the library on Saturdays and once bought him a science encyclopedia she could barely afford to nurture his appetite for books. “She put education first,” he said in an interview. Mr. Contreras will take over a lower Manhattan school that faces criticism for its lack of diversity—only 4% of its students were black or Hispanic in 2014-15, according to city data. He said he would consider starting an intensive summer program on campus to prepare aspiring applicants, recruiting alumni as mentors and developing partnerships with middle schools that haven’t sent many students to Stuyvesant. With a bachelor’s degree from Binghamton University and a graduate degree in school administration from Long Island University, Mr. Contreras was a social studies teacher in the Bronx and Queens, and principal of the Queens High School of Teaching, Liberal Arts and the Sciences. City officials said he expanded Advanced Placement courses there, built partnerships with colleges and enhanced SAT preparation. As executive director of social studies for the city Department of Education for the past two years, he led a team updating the curriculum to meet the state’s new expectations. With two sons in public schools in his Queens neighborhood, he said, he saw the results of that work “coming home in their backpacks, and that is deeply satisfying.” His wife is a school psychologist. Mr. Contreras’s new salary of $149,604 will mark a pay cut from his previous one of $163,878, according to the education department. He succeeds principal Jie Zhang, who left this month after four years to become head of New York Military Academy, a private boarding school. The article originally appeared on http://www.wsj.com. Written by Leslie Brody, leslie.brody@wsj.com. This entry was posted in News on July 27, 2016 by lul-admin.